Tax free investment vehicles have been around the world for decades. The United States has the Roth IRA. The United Kingdom has the Individual Savings Account (ISA.) The Canadian version is called the Tax Free Savings Account (TFSA) and it’s relatively new – only 9 years old. Tax free accounts give investors a way to save money using their after tax income. And any investment growth inside the account is not taxed, subject to certain restrictions. Last year Canadians held on average $17,300 inside their TFSAs. That’s not much, but the good news is most people who read this blog have way more saved. I recently conducted a poll asking readers to share their TFSA balances. It seems that 4 out of 5 voters have over $20,000 stuffed away in a tax free account. And surprisingly 8.5% of readers say they have over $100,000. Hey, not too shabby! 🙂 Full results below. A tax free vehicle is very powerful because it can save us hundreds of thousands of dollar in taxes over time. For example, I currently have about $100,000 in my TFSA. Let’s assume I don’t contribute anymore money and leave it alone to grow at 7% a year. 30 years later my account should be worth $711,000. You can also visit my portfolio page for real time numbers. Congrats on the savings. I as well have maxed out contributions every year since inception of the TFSA. Slightly below what you have amassed so far. Your losers are not big time losers so not much harm done there. 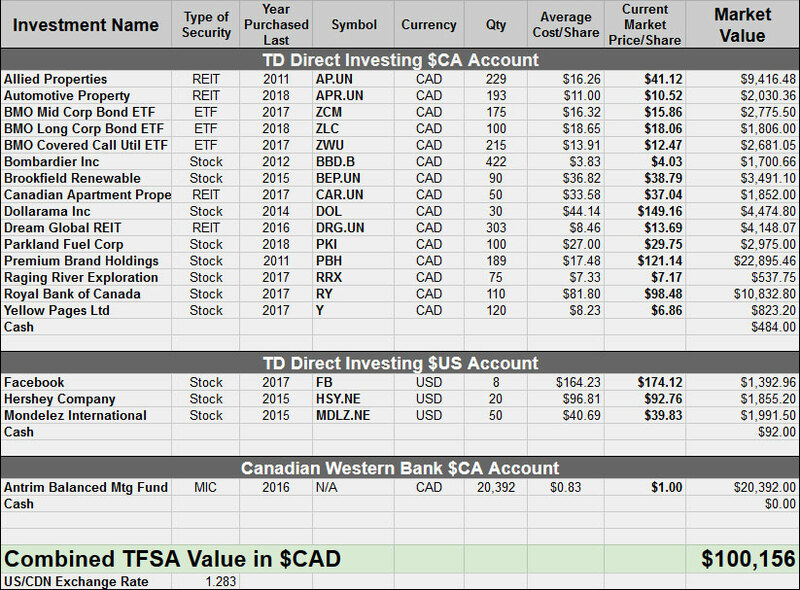 I do not invest in any US of A stocks within the TFSA as, as far as I am aware, they are taxable by the US CRA on both divs and cap gains. Different in an RRSP where they can slide though because of tax agreements between Can and the US. People reading the financial blogs are usually, or will become, more financial literate and will realize the financial benefits to utilizing what savings plans are available in order to maximize their savings out of harms (taxes) way. Having said that, not everyone has the means to both live (life expenses) and save to the max. The person with $10K in their TFSA could just as savvy as any one of the higher rollers – and vise versa. It is one of the quirks of life – you have to spend money to live. I wish living didn’t have to cost so much. This month gasoline prices in my city just reached a new record for all of North America. Luckily I take the bus to work now, but I feel bad for everyone else who drives regularly. I agree that the TFSA is not the best place to hold U.S. stocks. Generally speaking the TFSA is good for investing in Canadian bonds, GICs, High interest savings accounts (HISAs), Real Estate Investment Trusts (REITs), and Canadian growth stocks, such as aggressive retail chains and mining/resource companies. Canadian dividend paying stocks already receive a dividend tax credit and will not significantly benefit from a tax shelter so they should be invested outside of TFSAs and RRSPs. eh… at some point you have to access your money and then the tax bears attack. then the difference is much much smaller. time for Apr networth update! Haha, that’s right. 🙂 I will post that next week. Nice, you have a $100K TFSA balance! I only have sub $80,000, I broke a $80K barrier for a little bit but now it’s back to sub $80K. That’s cool. And you probably have a bigger RRSP balance than me. 🙂 I’m looking forward to see your new net worth update.